A major design consi derail or for HP's millimeter-wave source modules was the user Interface In operation the modules are to be functionally transparent to the user. Frequency, power, and modulation control oi the modules via the front panel of the source driver was a primary design requirement. As many of these features as possible are made available to owners of existing HP microwave sources, yet the Interface architecture is sufficiently general to support future expansion of the remote module concept. The source module Interface uses a multlwire cable and a D subminiature connector to route signals between Ihe module and the source driver. This connector was chosen for Its low cost, ease of assembly, and field-proven ruggedness. Extensive EMI testing performed on other HP products using this connector provided a high degree of confidence in its RF shielding. The Interface cable used with the D connector was designed specifically for this application This cable contains 20 wires and one Icw-capacltance coaxial cable, with Ihe size of each wire tailored to suit the signal requirements. In this way, the cable is kept small and flexible without compromising performance. The coaxial cable Is intended for returning low-level signals from the module's power detector to the source driver's leveling circuitry. This approach supports present requirements, yet leaves enough spare connections for future needs. 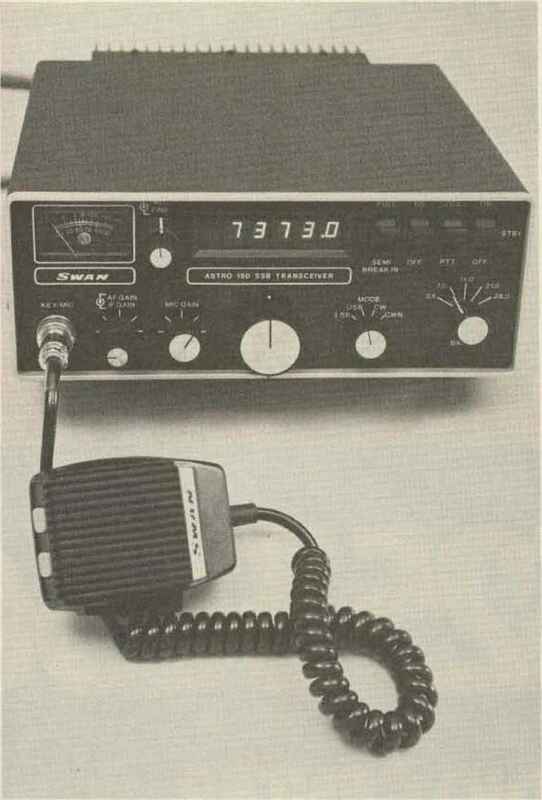 From the beginning, it was known that the driving instrument would need to communicate digitally with the source module. This would allow the controlling instrument to display such things as frequency span and power level, and permit the module to supply bandswitch points, calibration constants, and other data to the instrumeni. Compelled by the desire to allow module operation with existing Instruments, the digital communication path Is reserved for enhancements only. Basic features such as frequency and power control or modulation are Implemented in such a way as to be backward compatible. Fitting the digital circuitry Into the module was another design constraint. A 4-bit-wide bidirectional data bus was chosen as the best compromise between precious printed circuit board space within the module and minimal pin use on the interface connector. Fig 1 shows a schematic diagram of the circuitry resident in the module. Data slored permanently in ihe nonvolatile RAM (NOVRAM) ¡s read by first loading each counter (U2 and U3) with the desired memory address and then enabling the NOVRAM data output Using a s:mlliar procedure, permanent programming of the memory is allowed when test points A and B are jumpered together. While this approach burdens the driving instrument's firmware design, it simplifies the hardware required in the module The module's complete digital interface requires only eight connections and five small ICs. A nonvolatile RAM was chosen to allow the stored data to be individually tailored to the rnicrocircults within the module. Since this means that each NOVRAM can contain different data, it is necessary to allow programming and storage of data on the assembly line. Information derived during normal production testing can be downloaded easily into the module. The major concern with this technique is accidental erasure of the NOVRAM. It was found that the simplest, most reliable method of preventing data loss Is to require that the NOVRAM programming mode be enabled manually. This prevents entering the programming mode unintentionally. The stored data is recalled immediately following an Instrument's power-up cycle to configure (he driving source properly for optimum module operation. Any refinement In module performance provided by the digital information is not available to users of older instruments that do not support this feature. Fig, 1. Block diagram of millimeter-wave source module digital circuitry. to sample the module s output power Because a diode detector's output is typically not linear with power temperature, or frequency some conditioning is necessary oefore sending me signal back to the source Fig 2 shows a block diagram of the circuitry used in the source modules The diode detector output is first amplified by a factor of 5 to improve the bandwidth and slew rate performance at low power levels. The logarithmic amplifier isa special design with external inputs tor compensating Hie temperature dependence of both its own logging transistor and the diode detector Two thermistors RT1 near the diode detector ana RT2 near the logging transistor, are used to sense the ambient tempera lure of each device To compensate for the detector's ioss in sensitivity at high power levels an adjustable current source sets the input level at which the logger gatn increases. Finally, the frequency response of the diode detector is smoothed by adding a correction voltage to the logger output. 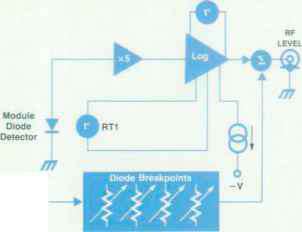 This correction signal is derived from the 0.5V<GHz signal sent to the module from the source driver using a simple diode breakpoint scheme. guide line. The input low-pass filter is formed by a series of alternating low and high-impedance transmission lines. The tripier diode is an integrated beam-lead device mounted directly across the narrow finline gap. The generated third harmonic propagates in both directions from the diode. Therefore, a quarter-wave backshort in ihe finline metallization is required to reflect the signal in the desired direction. The tripled signal propagates down I he gap and couples into the waveguide via the exponential impedance transition formed by the thin-film metallization. The thin-film capacitor shown in Fig. 4 provides RF continuity and self-bias holding In addition, the diodes are biased to reduce conversion loss at low power levels. A probe coupler [Fig. 5) is included in the integrated microeircuit to provide leveled output power. The metallic coupling probes are photo 11thographically printed on a fused-silica substrate. 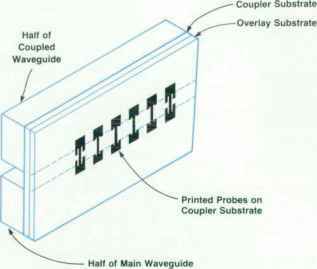 A clear overlay substrate placed on top of the probe pattern isolates the probes from the waveguide housing and provides symmetry to the electromagnetic fields. The metallic probes extend partially into the main waveguide and sample a portion of the energy in this guide. This sampled energy is transferred through the waveguide housing and radiated by the portion of the probes extending into the coupled waveguide. Since the probes are spaced one quarter-wavelength from each other, a forward wave is transmitted and a reverse wave is suppressed. The coupling probe shape is optimized for frequency flatness and directivity. Typical performance of this type of coupler is 16-dB (±1.5 dB) coupling with 1 7-dli directivity over a waveguide band. APRIL rasa HEWLETT-PACKARD JOURNAL 21 © Copr. 1949-1998 Hewlett-Packard Co. Fig. 2. Block diagram of millimeter-wave source module analog circuitry. capability in addition to simple output power control. 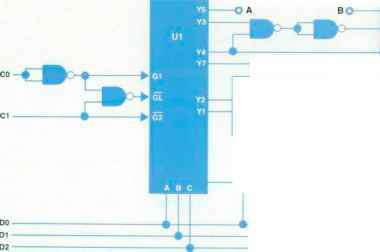 In fact, these modulation features can De a significant factor for a user considehng a new source While the basic principles behind ALC operation are simple, most modern designs are not. The millimeter-wave source modules use the source driver's leveling circuitry to conserve space The modules incorporate an integrated coupler and detector the millimeter-wave source modules this is accomplished by a finline detector. The energy propagating in the coupled guide is coupled first into the fused silica dielectric. Finline metallization similar to the exponential impedance transition previously described is then introduced. A close-up of the narrow finline gap region in the vicinity of the defector diode is shown in Fig. (3.